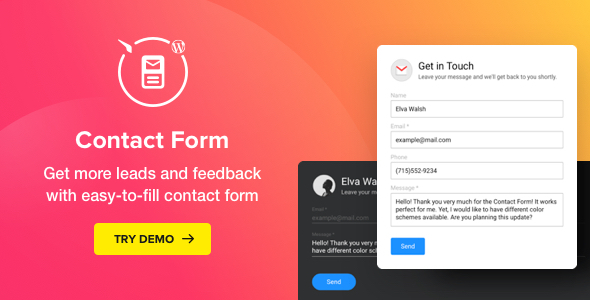 Elfsight responsive Contact Form for WordPress is a simple yet richest in customization options tool to display a clear and encouraging form, where your visitors can write their messages to you. Show the fields necessary for you, choose the right layout, and customize the look to inspire your customers to leave their feedback. Set the email address on which you would like to receive the messages and use the feedback to develop your business in the most profitable direction. Our WordPress Contact us Form plugin was made to meet your any need for receiving feedback and staying in touch with your customers. The fields are totally customizable and allow you to set them in any order you need, change labels, add placeholders and choose which ones will be required to submit a message and which you would like to hide so that the form is easier for your clients to fill in. Order the fields to make focus on your needs or display them the most common way. You are free to reorder them to find your best variant. Don’t need too much info from your visitors? Then choose which fields will be displayed and show that you care for your clients’ effort and time. Feel free to give the fields the right labels, which suit your goals and speak the language clear to your audience. You can make any field a required to fill for sending a message. Choose the ones you need and they will be automatically marked with * symbol. Validation process goes at client side. Apply placeholders for the fields and they will give a hint to your users at how to fill in the form correctly, so that you receive the data the way you need it. No more losing what has just been typed. Make sure the data your clients have already entered will not disappear. Our Contact form widget will save the filling progress whatever happens. Here’s where you can use the power of your imagination to make your responsive contact us form for WordPress encouraging for your visitors and increase their trust. You can create an inviting title, write an informative text for caption and add a picture to make the form brighter. How to get the best of it is up to you! A title before the form is an easy way to invite your visitors to fill in the form. So make the title really persuasive. Use phrases like “Contact us”, “Leave a message” or invent something unique that will sound the best for your clients. Caption text is displayed just above the form. Use caption to deliver technical details, for example, response time or other info that your customers should know. Find a nice picture to make your WP contact form plugin look more inviting. Choose an email icon, stick to your own photo or a photo of your support contact or find something unique – it’s your choice! We created the Contact Form that can follow all your requirements. Whether you need a classic design form set on the contact page, or a floating message button for your landing page – our plugin allows you to do both. Displaying a WordPress contact us form on the contact page is the most common way, but our plugin has something brand new: it will automatically adjust the field layout to the chosen width of the form, so that it looks seamless almost everywhere on your site without too much effort. For those who would like the contact form to follow visitors’ browsing, we are proud to offer an expandable contact form, which is always at hand. Just a click on the message icon in the right corner and the contact form widget comes up ready for filling. 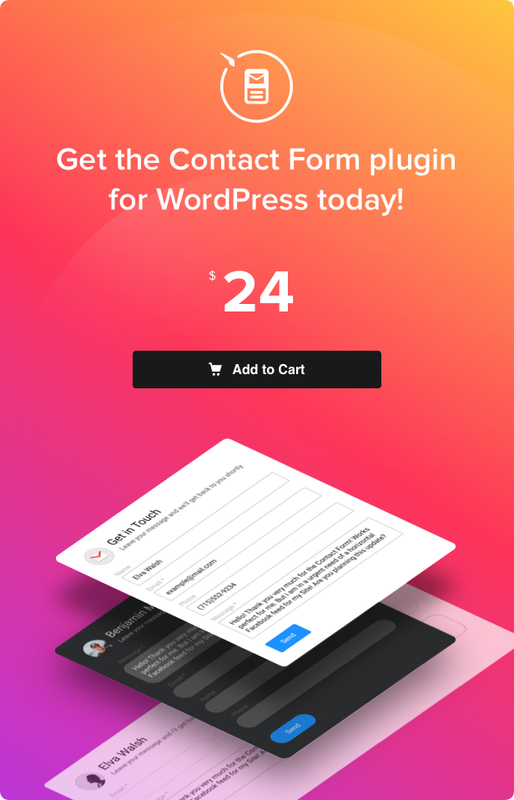 Our WP Contact Form plugin is ultimately responsive, so you can easily customize the width of the form to meet your needs and to integrate it seamlessly into design of your website. Whatever width you prefer, the form will look excellent on any mobile device. We put our best knowledge to ensure submission process is smooth for your visitors and the most secure for you. For this, we equipped our Contact Form with spam and bot protection technology, seamless message submission and customizable “Thank you” message. We take security seriously. 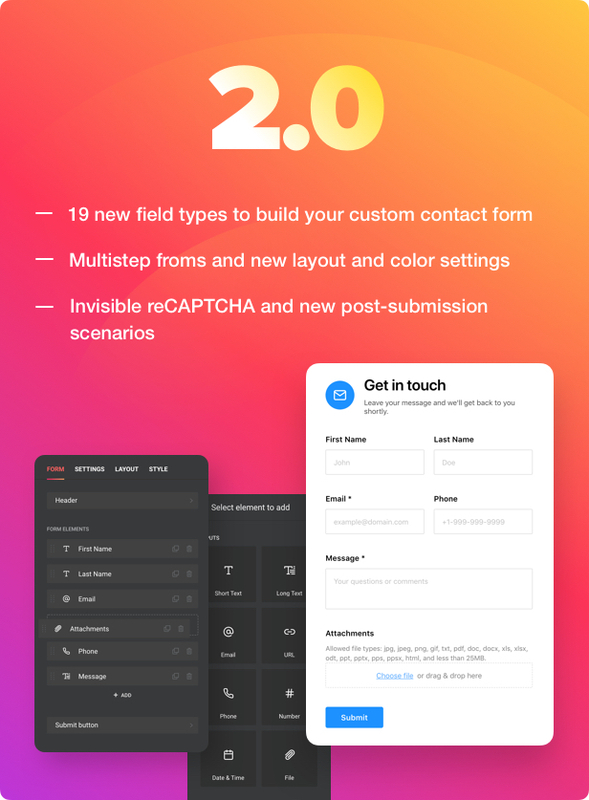 Our WordPress Contact form plugin is protected by Google reCAPTCHA and it will safeguard your email from spam and bots. This is easy for users but effective for you. Let your clients feel that you value their feedback. Create a powerful “Thank you” message, which is displayed with animation. You can add any text and not only express your appreciation, but also provide details on answer time or other instructions. Give you customers a seamless message submission. Our Contact Form sends messages via AJAX, which allows to avoid page refreshing and gives your clients smooth user experience. After creation of a Contact Form in WordPress admin panel, you will receive its shortcode. You can use it as any other shortcode, for example, add it to the page. 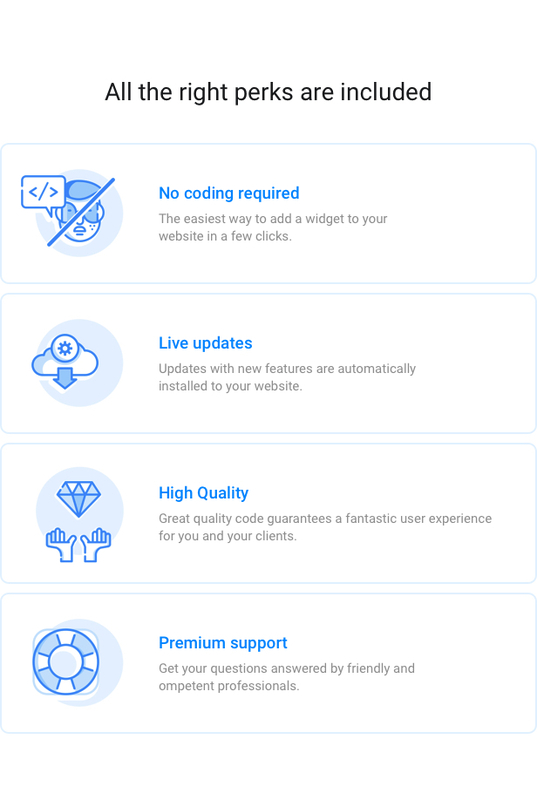 Our plugin includes Visual Composer element of one of the most popular page builders to make it handy for you to use the plugin if you are using the builder. You can easily add Contact Form widget to any WordPress sidebar or footer of your website for better user experience. Activate your plugin. Go to plugin settings page via main menu. Create a new widget and customize it using Live Widget Editor. Copy and paste the shortcode of the widget to the required page of your website. Then just get in touch with our Support team at support@elfsight.com and you will get professional help quickly. Expect a response from 10am to 7pm CET Monday-Friday. We are always open to our customers and willing to get better! We have 10-year experience and we are a tight and trusted team of full-time developers sharing the same goals and putting our best knowledge into what we do. We highly prioritize bringing the feeling of satisfaction with our plugins to our clients! Our plugin doesn’t work properly on your website? Report your issue or bug by describing it in detail and providing us with a link to your website. We will do our best to find a solution. We release new updates and features on a regular basis. Just don’t forget to check for the latest version in your WordPress admin panel. We are open to your ideas. If you need some specific features, that might also improve our products, then just drop us a line. We will consider implementing them in our future updates. We don’t offer installation services for our plugins. However, if you don’t know how to add a Contact form to WordPress website, we’re happy to provide you with installation tutorials. And if any errors come up during installation, feel free to contact us. If you still want installation to be done by a professional, we can recommend to use service of Envato Studio. We don’t provide plugin customization services. If you need to modify the way some features work, share your ideas with us, and we will consider them for future updates. We don’t fix bugs or issues related to other plugins and themes, created by 3rd-party developers. Also we don’t provide integration services for 3rd-party plugins and themes. You can always contact us at support@elfsight.com and leave your feedback. If there’s something you wish to see in our WordPress Contact Form plugin, we will be glad to hear your suggestions and ideas. The most requested features will be included into future updates to make our clients happy and help them achieve their goal. In case you need any custom feature right now, we recommend to address Envato Studio, the team, which is in charge of custom work. Would like a professional to create contact form for your WordPress website for you? Envato Studio team is always here to help with your requests. Still haven’t checked our plugin live? Do it right now on WordPress Contact Form plugin page! * Header text formatting: typeface, align, list, links available. * Painting in one click - choosing the main color will paint all active elements, submit button, progress bar, etc. * URL of the page where the form was submitted is now added to the message text. * The plugin's name was removed from message text.